The Portable Reader offers a new and convenient digital reading experience. It boasts an amazing screen with technology that rivals text on paper. Weighing less than 9 ounces and at only 1/2" thin, it's more compact than many paperbacks. Plus, it comes with a soft, black cover and software that seamlessly allows you to search and browse thousands of electronic book titles from the Connect™ eBookstore and then easily transfer from your PC to your Sony Reader with built-in memory and multi-format support, you can take many of your favorite titles and documents with you. So compact and convenient, you'll want to take it everywhere. The Sony® Reader provides a new way to experience reading. It boasts an impressive 6 inch display, utilizing breakthrough E Ink® technology that’s almost paper-like. In addition, the text can be magnified for sight-impaired readers. Daylight readable, high contrast, high resolution, near 180º viewing angle. The Sony® Reader offers a unique, on-the-go reading experience. With a very compact and lightweight design, you can take it almost anywhere. More compact than many paperbacks, it weighs 9 ounces (without cover) and is ½” thin. You can easily hold it in one hand while sipping coffee with the other. And with its rechargeable battery, you can turn up to 7,500 continuous pages on a single charge. Reduce multiple, large hardcover books into a compact package for people on-the-go. The Sony® Reader offers a unique, on-the-go reading experience. With a very compact and light design you can take it almost anywhere. And with 64MB of internal memory, and a slot for optional removable memory cards you can take many titles, user-selected Web content, or other supported documents for reading on the go. Will hold up to 80 electronic books in internal memory and hundreds more with Memory Stick® media or SD memory card (sold separately). The Sony® Reader will allow you to search, browse and discover thousands of popular electronic book titles from the CONNECT™ eBook online store. You can then purchase and download these titles to your PC and easily transfer to your Sony® Reader. The Sony Reader isn’t just about reading electronic books. Using the included CONNECT™ Reader PC Software, you can easily transfer Adobe® PDF documents, BBeB Book, and other text file formats to the Reader. Also, search, browse and download user-selected RSS Web content from the CONNECT™ Store to the PC and easily transfer to the Sony® Reader. Take along Web newsfeeds, blogs and more to read. 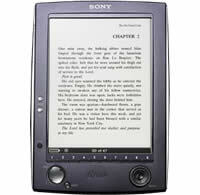 The Sony® Reader is extremely energy efficient. Its rechargeable internal battery can power you through up to 7,500 continues page turns, so you are ready for the long haul. The battery can be recharged in as little as 4 hours with the included AC adapter and even can recharge from your PCs USB port if you choose. This page is part of GeneralManual.Com Network Sony PRS-500 Portable Reader System User Manual.